Rio Grande senior Kenny Council had 17 points and 11 rebounds in the RedStorm’s 80-64 loss to No. 12 Indiana University East, Tuesday night, at the Newt Oliver Arena. RIO GRANDE, Ohio — It’s funny how one official’s call — midway through the first half — can upset the flow of a game for one team. Unfortunately, on Tuesday night, the University of Rio Grande men’s basketball team was the victim in just such a scenario. 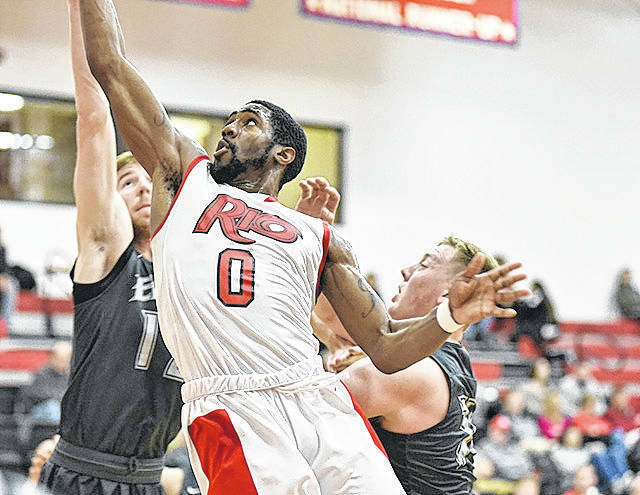 Indiana University East used late run before halftime to create a measure of separation and another spurt of the final seven minutes to pull away for an 80-64 win over the RedStorm in River States Conference play at the Newt Oliver Arena. The Red Wolves, who climbed from No. 6 to No. 3 in the latest NAIA DII men’s Top 25 poll released shortly before game time, improved to 11-2 overall and 2-0 in the RSC with the win — their seventh in as many meetings with Rio Grande. The RedStorm had a modest two-game winning streak snapped, falling to 4-9 overall and 1-2 in league play. Rio — as it had done in each of its previous two outings — got out of the gate well by scoring 13 of the game’s first 17 points and led 18-11 after a three-point goal by senior Will Hill (Worthington, OH) with 10:45 left in the first half. Hill was assessed a technical foul, though, for, allegedly, making a gesture toward the IU East bench which video later showed did not happen. Charles Peterson hit both of the technical free throws for the Red Wolves and Bishop Smith added a bucket on the ensuing possession after the free throws to make it 18-15 and, after Hill was forced to the bench two minutes later for another foul, IU East eventually grabbed a 21-19 lead after a basket by Datrion Harper with 8:03 left in the half capped a 10-1 run. The RedStorm hung tough in Hill’s absence and led 26-25 after a basket by senior Kenny Council (Jacksonville, FL) with 5:25 remaining before the intermission, but IUE finished the half on a 14-4 run and enjoyed a 39-30 edge at the break. The Red Wolves stretched their advantage to as many as 12 points with just over 14 minutes to play in the game before Rio made things interesting by closing to within five, 63-58, after a three-pointer by freshman Trey Kelley (Minford, OH) with 7:33 left in the contest. The RedStorm only managed six more points the rest of the way, while IU East widened the gap to its final margin behind Aaron Thomas, who eight of his 10 second half points in the final 5-1/2 minutes. Harper led the Red Wolves with 18 points, while Thomas finished with 12 and Lucas Huffman had 10 points — all in the second half. Thomas also yanked down 10 rebounds for IUE, while Jacoby Claypool had a team-high five assists and game-high three steals. IU East, which has reached the national quarterfinals twice and the national semifinals once in the last three years, shot 54.8 percent in the first half, 57.1 percent in the second half and 55.9 percent for the game. Hill — the reigning RSC Player of the Week — led Rio Grande with 20 points and had a game-high six assists. Council finished with 17 points and a game-best 11 rebounds, while sophomore Stanley Christian (Norfolk, VA) added 13 points in a losing cause. The RedStorm shot just 36.2 percent (21-for-58) for the game. Rio Grande returns to action Saturday afternoon at Ohio Christian University. Tipoff is set for 3 p.m.